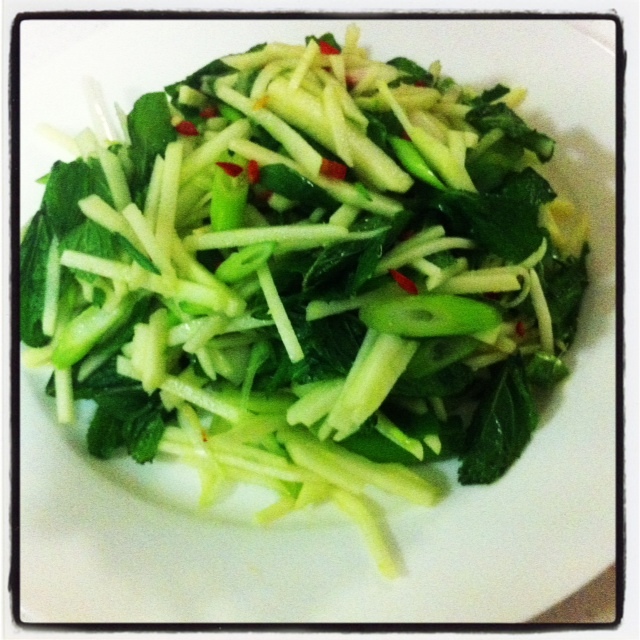 chilli caramelised pork with apple and mint salad – Are Your Planets Keeping You Fat? Taurus is all about things like taste and food…and swallowing your feelings. The trick is in convincing your taste buds that you are giving them what they want. And what they want is something sweet, tasty, that looks good to the eye and feels good in the mouth. And, this one feels sort of Taurus Moon-ish to me. The apple and mint, with just a fleck of red chilli looks pretty, the smell as you tear the mint with your bare hands is amazingly fresh, the apple gives a pleasing crunch and as for the taste? This recipe has it all- that salty, sour taste from the tamarind, the hot spice from the chilli, the sweetness of the palm sugar and as for the salad? Let’s just say it takes the whole traditional pork and apple sauce to a completely new level. OK, up front, if you are on the no sugar bandwagon (and trust me, I am right there with you), you may not want to try this one- at least not if you are in the initial stages of your sugar detox. Any recipe that has “caramel” in the title will involve the use of something sugary- after all, that’s what caramel is. Anyways, here is the recipe from my current favourite recipe book Hot Plate by the team from my all time favourite restaurant Spirit House (at Eumundi on the Sunshine Coast). Oh, this serves 4 & can easily be adjusted for a single serve…or more. Swap the soy for gluten free tamari and you have a gluten free dish. 2 pork fillets (trim them of all the sinew and other bits). Tonight I’m using pork loin chops instead- I like to chew the bones- the caramelised bits are super yummy. 100 mls of tamarind water (I use a hunk of tamarind paste soaked in boiling water and then strained through a fine sieve). You can buy tamarind paste though- just a tablespoon in water will do the trick. Place the tamarind water, whisky, palm sugar, sauces, spices and lime zest (not the juice, not yet…) in a saucepan & bring to the boil. Reduce to a simmer and cook until slightly syrupy (that’ll be the caramelly bit and should take about 5 minutes). Remove from heat, stir in the lime juice and set aside to cool. Once the syrupy stuff has cooled, marinate the pork fillets in half of it while you get on with the salad. The rest will become a sauce for the cooked pork. To cook the pork, heat the barbecue to medium and grill the fillets, turning regularly and basting with the marinade frequently. It will take about 20-25 minutes and will need resting for about 10 minutes. Oh, the chilli caramel marinade will make a mess of the Barbie…get over it. Slice into medallions and transfer to serving platter (I used a wooden board) and pour over the re-heated sauce. Serve with apple salad on the side. 1 cup washed mint leaves. Combine the lime juice and palm sugar and stir until it dissolves. Add the remaining ingredients and toss gently to mix.